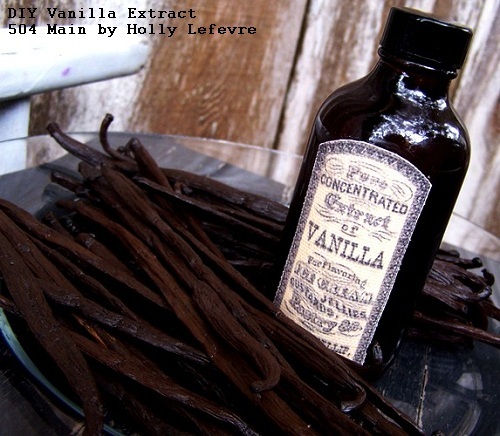 but last year I made homemade vanilla extract and it was a huge hit. Thing is, you gotta make it now! Those vanilla beans need to flavor that vodka for weeks and weeks. and much appreciated DIY Holiday Gift now! I go through Pure Vanilla Extract by the gallons..or so it seems. I put it in everything...pancake batter, waffle batter, coffee, oatmeal- you name it! 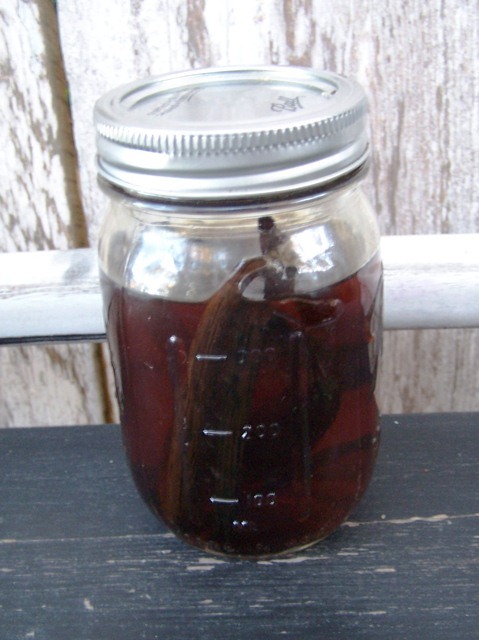 So, here is the story...last year I was snooping around on twitter and I saw Kari from UCreate tweet about making your own vanilla extract. I was astounded - remember now, up until a few years ago, I did not really cook, so I had never imagined I could do such a thing. I, of course, misplaced that link and then started looking around the Internet (Kari was sweet enough to respond back to my message) and seems everyone makes their own extract! OH-MY-GOSH! I LOVE THIS STUFF! I told a few friends and they wanted to try it too...but I did not Pin the recipe or save it or anything else. I started googling it and turns out quite a few people make their own (I also emailed Kari and she was sweet enough to send me a link too). 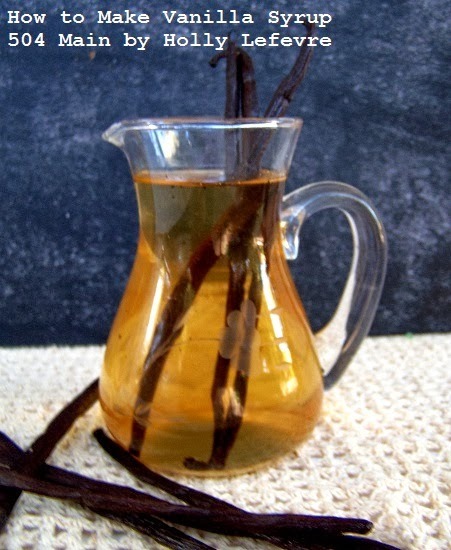 I would have never guess that Vanilla Extract was so super easy to make! THERE IS STILL TIME TO MAKE YOUR OWN EXTRACT BEFORE THE HOLIDAYS TO GIVE AS GIFTS! 1. I used Facebook (created an event) and word of mouth to tell everyone. 2. I calculated my costs and charged everyone a fee. Now...here I will let you in on my DUNCE moment. I calculated my alcohol by gallons into quarts and pints. ALCOHOL IS SOLD BY THE LITER...1.75L TO BE EXACT. You only get 2 quarts from a 1.75L bottle. I calculate 4 quarts to a gallon. BIG OOPS! I admit this so that you do not make the same mistake. 4. I also headed to the Dollar store to purchase paring knives and small cutting boards. I had over 12 people come and certainly did not have enough to accommodate that crowd. 5. I kept it simple and served very light hors d'oeuvres and some beverages and a few ladies brought goodies as well. Then we got busy! 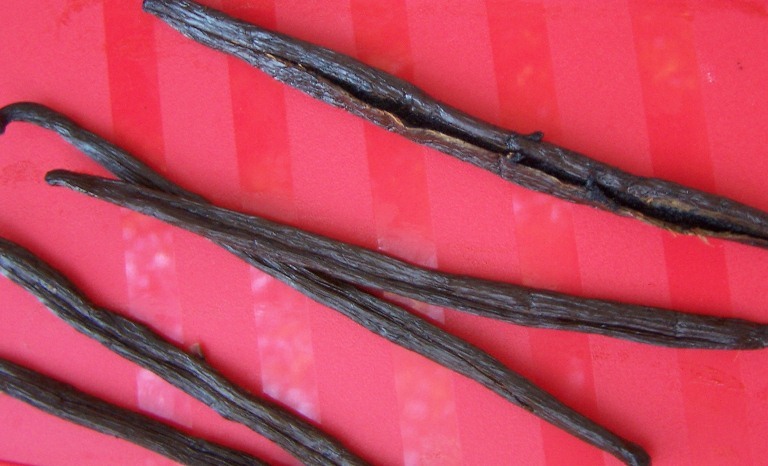 Vanilla beans are expensive if you buy them at the regular store, ranging from $2.99 a bean to crazy amounts of money. Buying them in bulk (I ended up buying 5 pounds total) was the cheapest and easiest. So...ask some friends if they want some beans too if you are not doing a workshop or do not needs a lot of beans and share the cost. You can get beans at Beanilla for about $1.00/bean for Madagascar Beans. 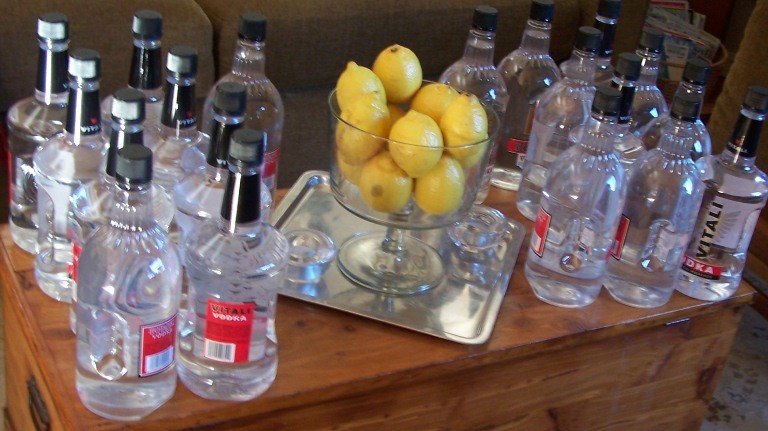 I did a lot of research and you do not need expensive fancy-shcmancy vodka. I have used Dark Rum too, but for the workshop we used (cheap) Vodka. Seriously, I purchased 19 bottles of Vodka at Safeway and Rite Aid. Buying in bulk, I spent $9.00 a bottle...Be prepared for some funny looks as you wheel your cart full of alcohol up to the checker! I decided to purchase all the jars we needed. 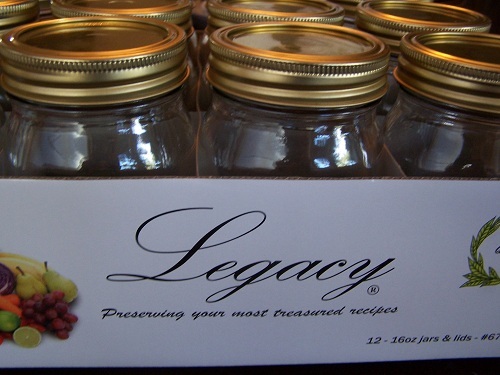 I looked for sales and found jars at the local hardware store for a reasonable price, but also found (almost) plain Legacy Canning Jars from Freund Container. 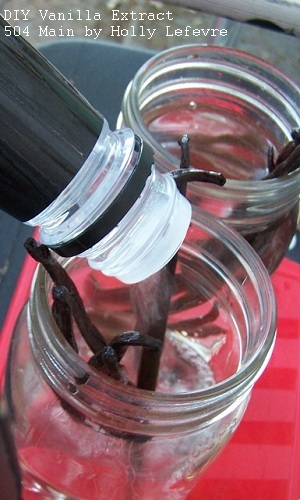 If you are giving the vanilla as gifts, you may also want to invest in smaller jars, 8oz. or so. I am the only crazy person I know who goes through pints and quarts of vanilla in a month. Freund also has smaller bottles as does local stores like World Market. Just be sure you bottles are food safe. I used 4-6 beans in a pint and 6-8 in a quart. You can use more - this is what I have done before. Different resources suggest different amounts. Slit each bean lengthwise, but not through the bean. Slightly bend the bean in half (along the slit) to "open" the beans up - BUT YOU DO NOT WANT THE BEAN SPLIT IN HALF. Place your beans in the jar. I also provided labels so everyone could write the date on their jars. 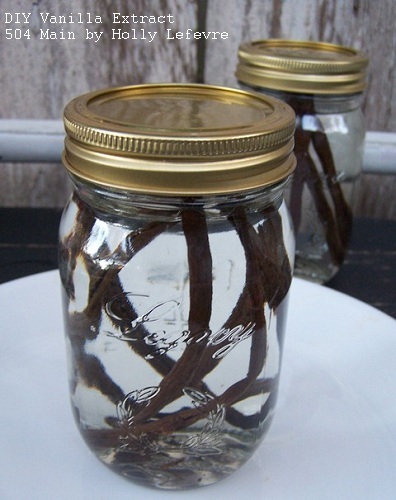 Take the jars home, place them in a dark place, and give them a shake every day or every other day. Ready in six weeks. Longer is even better! 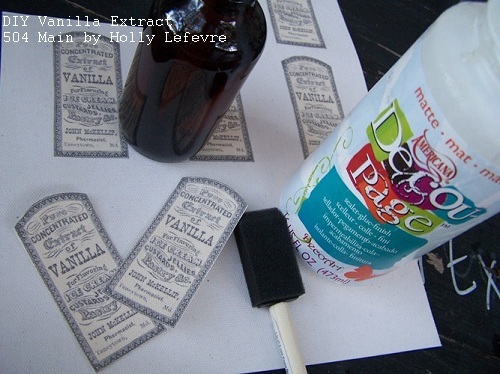 If you run short on time, you can even consider adding a tag: "Homemade vanilla for you to bake a sweet treat. It will be the perfect age on (insert date)." Honestly, the first batch I made I left in the pantry for 8 months and never shook it once...it was divine! This is from my first batch! Package the bottle as you wish! 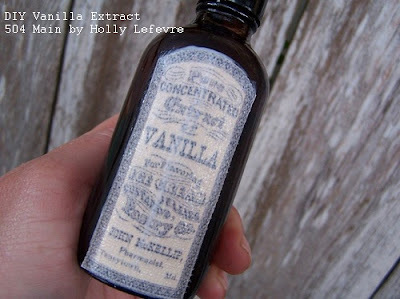 The Graphic fairy has this amazing Vanilla Apothecary Label that I am using. I printed the labels out on Canvas Paper (Office Depot). Cut the labels out. Place a bit of decoupage on the back of the label and let it set (I put a couple rubber bands around the label so I did not have to hold it.). Then I finished it with another coat of decoupage. The excess on the bottle can easily be wiped off. 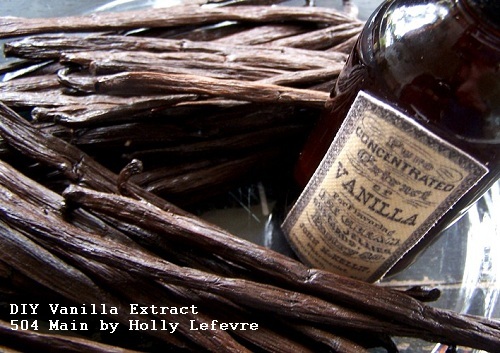 but how about whipping up a Vanilla Syrup for use in your coffee or on its own! I love this idea! If only I could find a way to make it without having to buy alcohol... haha. I love the bottle labels you made-- so pretty! This is amazing, Holly! I have been wanting to make some for ages. I appreciate all of your tips and tricks! I'm LOVING the details of this post. I wanted to do this last year and didn't get started in time but I'm definitely going to do it this week. Thanks for the great list of resources! 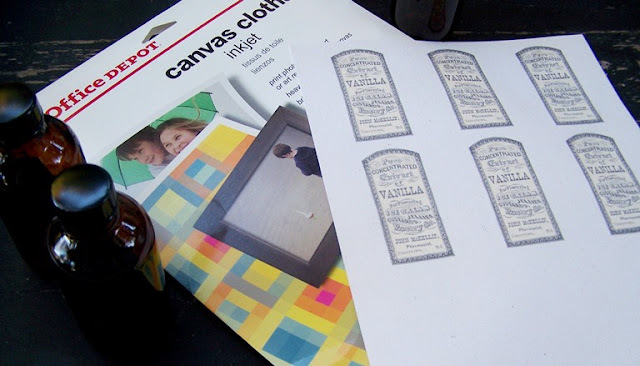 And I love that graphic ... and the canvas label! You're a wealth of information! I have always wanted to do this Holly! Maybe this year I can actually get it done! Thanks for all the details! Beautiful packaging and I bet it is DEELISH! For those readers looking for an alcohol-free "extract," here is a recipe I ran across in my search for one. Mix in glass jar the glycerin and hot water. 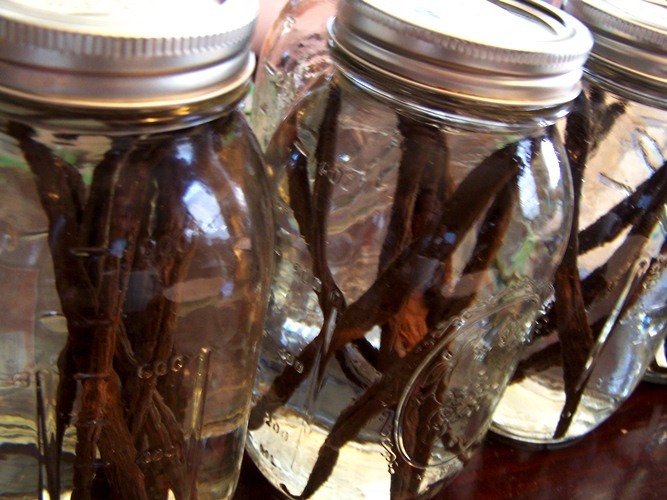 Split beans, remove seads, chop pods, all seeds and pods to jar. Replace lid, shake well. Shake daily for a week, then every couple of days. Store in cool, dark place (no refrigeration required). This "extract" will be ready, ideally, in about four months, although some have used it in as little as six weeks.